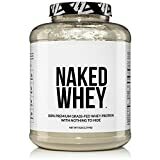 Whey protein, also referred to as a complete protein because it contains all the essential amino acids, is produced during the cheese-making process. When the cheese producers add a certain enzyme to the milk it separates the milk into curds (from which cheese is made) and whey protein. The whey protein naturally occurs in milk and makes up around 20% of each milk part. The “wet whey protein” is then treated and dried, before being put in containers and shipped all around the world. So how does this help you choose the best organic whey protein? Well, to get organic whey protein, you need to look at how the milk was produced. To get to the milk, you need to look at the cow. 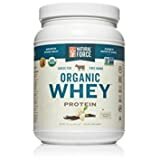 Organic whey protein thus is a whey protein made from the milk of an organically fed, hormone free cow. Here we’ve listed 10 of the best organic whey proteins currently on the market. 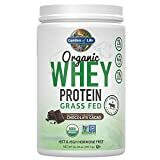 "MAXIMUM NUTRITION: 25g of Protein, 2g of Sugar, 3g of Carbs, 120 Calories, and 5.9g of BCAAs (branched-chain amino acids) per serving. " Sourced 100% from US Sustainable Small Farms. 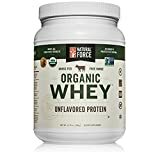 There’s a lot of debate about the technical difference between conventional whey protein (due to it being derived from milk as a protein isolate) and organic whey protein, but the consensus among regular consumers of organic whey protein is that it’s easier to digest and doesn’t leave them feeling bloated. If you’re concerned about what is in the supplement, organic is the best route to go to rule out most of the bad stuff. If it’s a moral choice and you’re concerned about the ethical treatment of animals, the organic route is the best route to go. Ultimately, as with most supplements, it’s a personal choice, as in this case the actual amount of protein you’ll get into your system will be very similar.